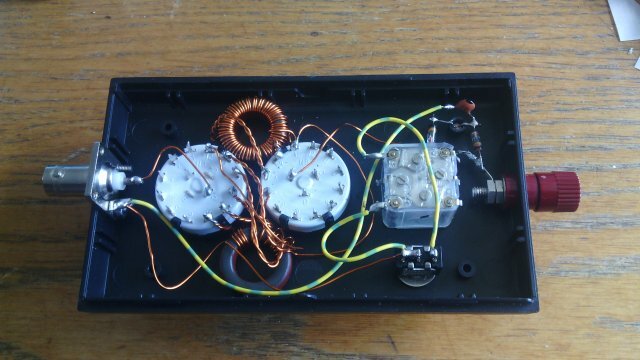 A time ago I have read the article "The Multibandfuchs by DL7AQT, Frank" on the website of QRPproject, a great source of idea's and products for QRP and homebrew in Amateur Radio. 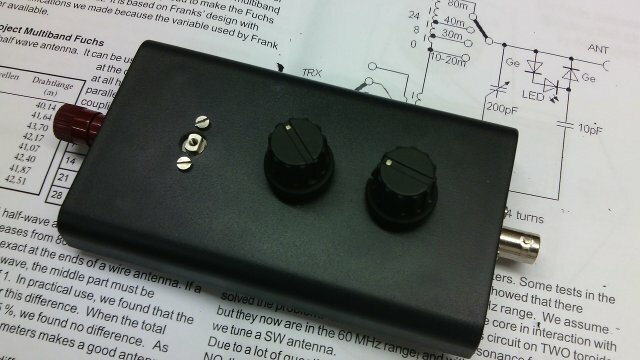 The great documentation and the IMHO almost magic posibilities with kind of antenna for fielddays, made me wanted to make one in the future (had some other projects on hand at that moment). 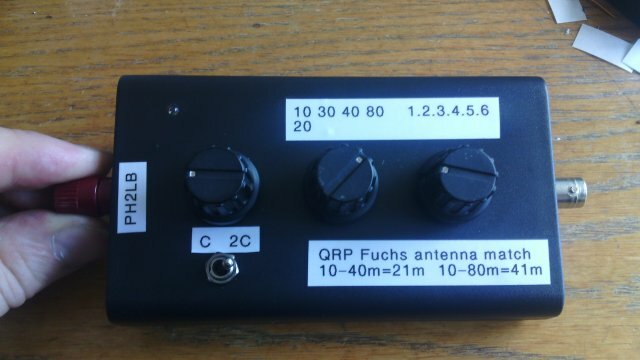 This page shows images of my version of the QRP Fuchs Antenna (which isn't realy a antenne but a Fuchs Antenna matching unit to be used with a Lambda/2 longwire with a length of aprx 41m (convering 10 to 80m) or 21m (covering 10 to 40m). 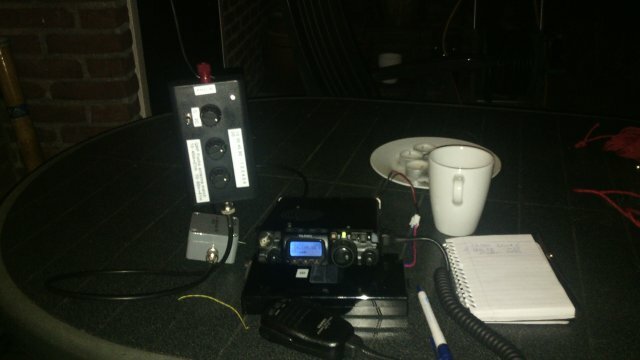 Update : On 10 aug 2014 i made my first field test and made my first QSO to OH99TT with it (FT-817 with 2.5W). 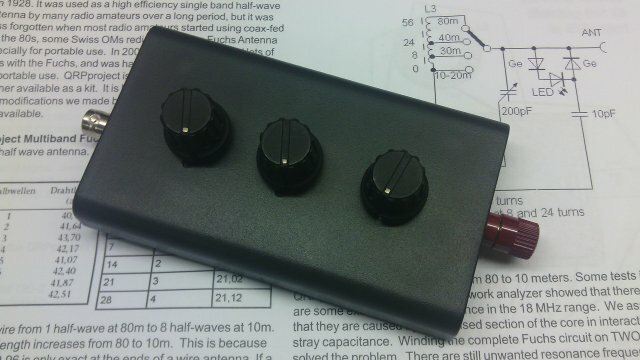 The longwire wasn't the best quality (used a normal AWG 23 / 0.25mm2) and the signal indicator needs to be added. But it seems to work. More test results will come. After the tests of 10 aug I changed the design a little bit because the original design had a 200 pF var cap in it and the one U used has 2 sections of 170 pF. 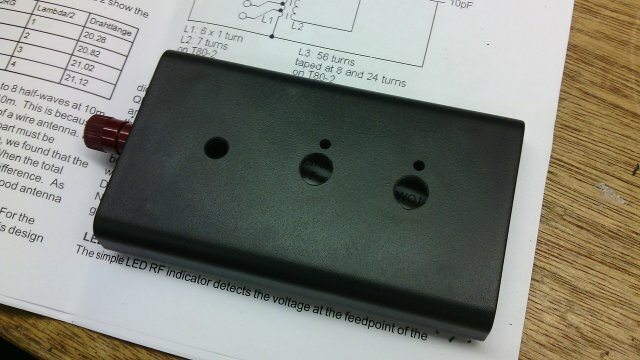 With switch I can between the range from 10 to 170 pF and a range from 20 to 340 pF. Also I added a few stickers to it because I constantly turned the wrong switch. To bad I don't have time to go for a field moment, but hopefully I have that later this week in the evening. 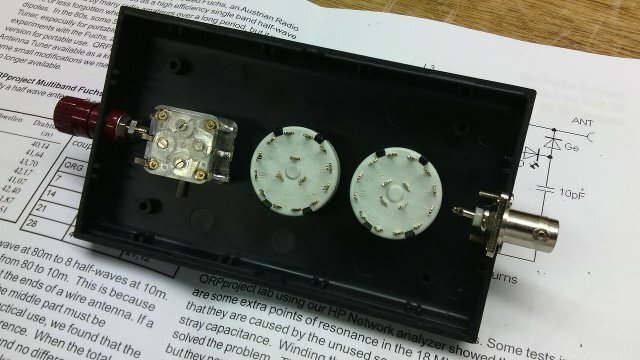 Update : On 12 aug 2014 it was a nice evening for experimenting with the Fuchs antenna. The C/C2 mod is working fine but the build in indicator is not workings as expected (why??). 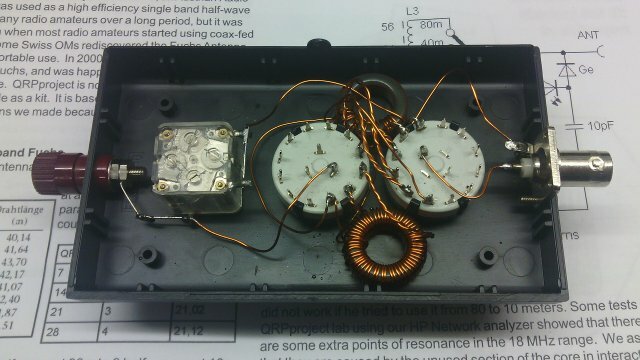 After removing the GND wire to the indicator C, I used my swr indicator box as a tuning / low SWR indicator. The combination is working perfect. The 21m wire is hanging on a 2m height in a almost U shape (9m + 9m + 2m) and after some listeing it was QSO time. Although there was a lot of statics and background noise I could added OM3LK and OG2F to my log with just 2.5watt out of my FT-817. Yep the Fuchs is one for the keeping.